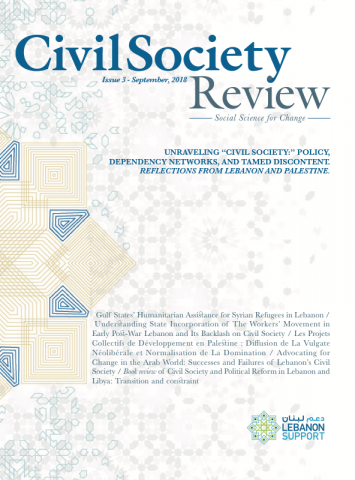 Published by Lebanon Support, the Civil Society Review emphasises cutting-edge and critical transdisciplinary analysis in a wide range of topics relevant to social sciences. It offers a novel space where academics and practitioners converge to discuss theories and reflect on practices. It demonstrates a variety of perspectives through dynamic, historicised, and processual approaches to reflections on civil society action, and strategies in the region. While we acknowledge the polysemy and controversy behind the concept of “civil society”, and the often elusive opposition it displays, we are committed to producing original literature that both offers a reflection on civil society, particularly its contentious role and autonomy, as well as creates knowledge for what we hope can constitute tools for action and social change in the region. In this vein, the Civil Society Review, grounded in empirical research, aims at contributing to a theoretical production adopting a comparative approach among countries in the region and elsewhere. It hence focuses on the creation of a knowledge space for epistemological debates, theoretical usages, as well as empirical methodologies. The Civil Society Review produces evidence-based research and analysis, and disseminates findings and recommendations to promote civic engagement, shape policies, and stimulate debate within civil society spheres. In addition to its editorial board, the Civil Society Review draws expertise from practitioners, experts, researchers, and policy makers. 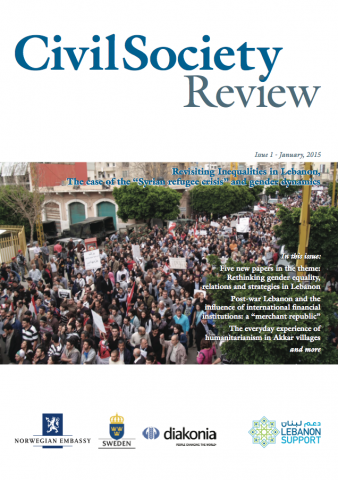 First published in print, the Civil Society Review is made available online at a later stage. Lebanon Support encourages contributions from experienced scholars, early career researchers, PhD candidates, practitioners, activists, and civil society experts. 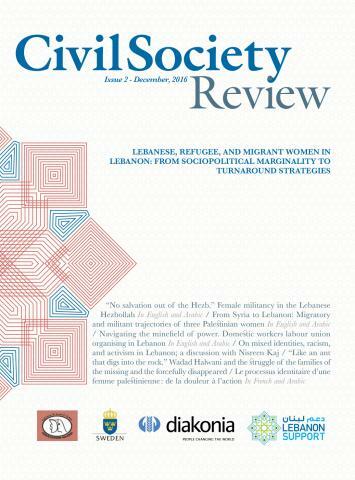 The Civil Society Review only accepts online submissions sent to: editor[at]lebanon[dash]support[dot]org. Submissions in English, Arabic, and French are accepted. Submissions must comply with Lebanon Support’s guidelines. Priority is given to submissions that adopt a radical and critical approach to related concepts and categories, engage with a solid theoretical framework, and are based on empirical research. 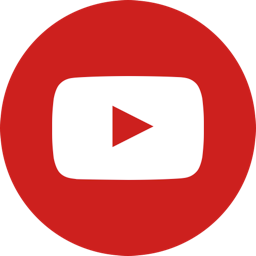 All submissions – of papers, and thematic issues – are reviewed by the editorial board, which can accept the proposal as is, suggest modifications, or reject it. If the thematic issue is approved, the issue editor is expected to follow up on the process of developing the issue, in collaboration with the editorial board. * In the case of submission of a proposal for a thematic issue, without identified authors/ article, and therefore requiring the publication of an open call, please submit the above documents mentioning in the subject line: Proposition of thematic call. Original Manuscript: Original Research papers should be between 8,000 and 10,000 words. Tables, figures, illustrations and references are included in the word count. Shorter articles: Original Research based on masters, or PhD dissertations. It can also feature contributions on ongoing research or work in progress, as well as portraits, testimonials, or interviews. Book Review: Book Reviews should be between 500-700 words in length and prefaced with bibliographic information in the following form: Title of Book Author/s or Editor/s Personal then Surname/s Place: Publisher Year ISBN Price, hb or pb pp. The review should conclude with the full name and institutional affiliation of the reviewer, each on a separate line. The page should contain the title, author names and affiliations, and acknowledgments with the corresponding author’s complete mailing address and email address. The abstract should not exceed 250 words and should summarize the article’s quest with or without conclusions, and without references. We encourage you to enter appropriate keywords, as this helps us match appropriate reviewers to your manuscript. All authors listed on the manuscript should have contributed significantly to the experimental design, its implementation, or analysis and interpretation of the data. All authors should have been involved in the writing of the manuscript at draft and any revision stages, and have read and approved the final version. Anyone who made major contributions to the writing of the manuscript should be listed as an author (“ghost writing” is prohibited by the journal). Any other individuals who made less substantive contributions to the experiment or the writing of the manuscript should be listed in the acknowledgement section. Any change in authorship (including author order) after the initial manuscript submission must be approved in writing by all authors. By submitting your manuscript to the journal it is understood that this it is an original manuscript and is unpublished work and is not under consideration elsewhere. Plagiarism, including duplicate publication of the author’s own work, in whole or in part without proper citation is not tolerated by the journal. Manuscripts submitted to the journal may be checked for originality using anti-plagiarism software. Authors should observe high standards with respect to publication ethics as set out by the Commission on Publication Ethics. Falsification or fabrication of data and misappropriation of the work are all unacceptable practices. Any cases of ethical misconduct are treated very seriously and will be dealt with in accordance with the COPE guidelines. All submissions to the journal are initially reviewed by the Review’s editorial board. Manuscripts which are not relevant to the journal or do not meet its criteria may not be considered beyond this stage. Desk rejection means that authors are given a quick decision and do not need to wait for the review process. Manuscripts which pass this stage are then sent out for peer review to an independent reviewer (and to an internal reviewer). The feedback from both reviewers will be submitted to an evaluation process from the editorial board and a decision on the manuscript, will be sent out to the author in a timely manner. Manuscripts may be accepted with some modifications requests that the author has to incorporate within 4 weeks, or with major modifications requests requiring a re-submission of the article within 2 months. In the latter case, the submission undergoes the review process again.